In order to make it easier for everyone to comply with Syracuse University’s new ICT Accessibility policy, ITS has negotiated discounted pricing with Automatic Sync Technologies (AST) for providing captioning and transcription services. Syracuse University and AST have worked together for over 12 years to offer high-quality, low-cost captioning services through integration with Ensemble Video. With CaptionSync, AST services can now be incorporated into the workflow for captioning a wide variety of video formats for other platforms, such as YouTube, Vimeo, and Blackboard. • You have a video or audio file that needs captions. • You have a video on your YouTube or Vimeo channel that needs captions. • You have a video in Ensemble that needs captions. • You have a video that will require audio description. • You would like to have a YouTube or Vimeo video that you do NOT own captioned. • You need live captioning for an event. This three part blog post from Level Access reviews the new WCAG 2.1 Success Criteria as they apply to the user groups that they affect most, and answers some common questions about the guidelines and how they relate to WCAG 2.0. All three posts are linked from WCAG 2.1: Exploring the New Success Criteria. Users of mobile devices, WCAG 2.1 provides updated guidance including support for user interactions using touch, handling more complex gestures, and for avoiding unintended activation of an interface. Users with low vision, WCAG 2.1 extends contrast requirements to graphics, and introduces new requirements for text and layout customization to support better visual perception of web content and controls. Users with cognitive, language, and learning disabilities, WCAG 2.1 improvements include a requirement to provide information about the specific purpose of input controls, as well as additional requirements to support timeouts due to inactivity. This can help many users better understand web content and how to successfully interact with it. WCAG 2.0 AA (Web Content Accessibility Guidelines) requires that audio description be provided for all prerecorded video content in synchronized media. The purpose of audio description is to provide access to the visual information in a video for people who are blind or low vision by adding a sound track that describes what is happening as it is taking place in the video. 3PlayMedia, a popular captioning vendor, is now offering audio description services. Visit the 3PlayMedia website to find more information about the features offered with this service. Additional vendors of audio description are listed on our Video Captioning Resources page. With the recent Microsoft Word 2016 for Mac update, 15.24.1, you can now use “Save as PDF” to create an accessible PDF document from Word for Mac. Prior to this update, Word for Mac did not transfer accessibility ‘tags’ to the PDF document so users had to perform in intermediate step of opening the Word document in Microsoft Word for Windows or LibreOffice and save it as an accessible PDF. In addition, the accessibility checker currently available in the Windows version is in beta for the Mac version of Word. 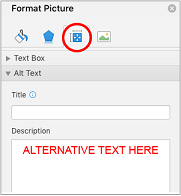 Find instructions for creating an accessible Word document and saving it as an accessible PDF on WebAIM.org. Copyright 2015. Adobe Systems Incorporated. PDF is an inherently difficult format from the standpoint of people who are blind using a screen reader to listen the PDF read aloud. Similarly, people with low vision and people with cognitive impairments using text-to-speech technology may encounter difficulties with improperly tagged PDF documents. While the process for creating accessible PDFs continues to develop, it is still far from intuitive or efficient. Instead, consider providing an accessible alternative in addition when distributing a PDF. For example, if you are emailing a colorful flier as a PDF attachment, include all the information from the flier in the body of the email. Let your readers know that all the information in the flier is contained in the email so they can be assured that they are getting all the important details. And of course, make sure the body of your email meets accessibility guidelines. Find information about creating accessible email and other document types in the Technology Accessibility Toolkit. Below are a few points that will assist you in determining whether your website is accessible. Our page, Common Accessibility Errors: And How to Fix Them, provides more extensive information on this topic. Are you able to navigate the website with a keyboard only using [Tab] and [Shift][Tab]? Can you see where the [Tab] focus is? Are there alternative text descriptions for all images? If video is used, does it have accurate closed captioning? Are the hyperlinks on this page descriptive and non-repetitive? Can you zoom in on the page without losing information? Can you double your zoom and still navigate the webpage? Is there a skip to main content link?